There are several components whose footprint has a 180° or even 90° rotational symmetry, but the component's electrical function is not symmetric. Therefore, if such a component is incorrectly rotated, it will appear to the casual observer to be properly placed, but it will not work. The corner next to pin 1 of the transceiver is marked with a small dot. The picture above also shows the orientation of the text printed on the package. The balun is marked with a square between pins 1 and 6. 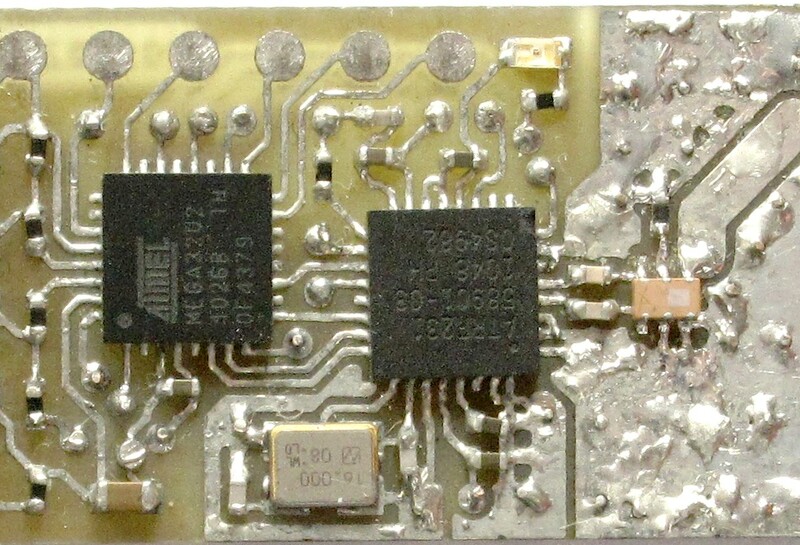 In atusb, the marking on the transceiver is on the corner between the crystal and the antenna. The marking on the balun faces towards the antenna. 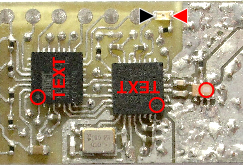 The microcontroller's "top" side faces towards the USB connector. It is difficult to determine the LED's orientation by visual inspection. An efficient approach is to touch the LED's terminals with the probes of a multimeter set to measure resistance. The small current used for the measurement will light the LED. 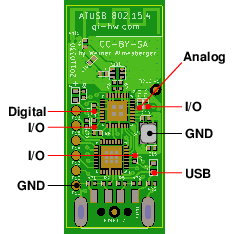 the analog (RF) supply, which is nominally 1.8 V.
On atusb, there is also the USB voltage domain at nominally 5.0 V.
Voltages should be tested in the following order: USB, then I/O, then digital, and finally analog. The table below gives the permissible ranges. Any voltages outside these ranges indicate a problem. Again, exit with Ctrl-C. Note that the transmissions may disturb nearby equipment operating in the 2.4 GHz band, such as 802.11 networks. This can be prevented by shorting the antenna to ground. 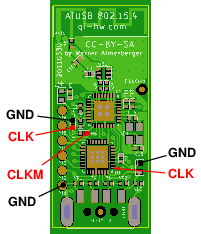 In case the board does not accept commands, only the USB and I/O voltage can be checked. If they are correct, proceed with checking the clock. Ground can be accessed at the cover of the crystal. Note that the fiducials, while looking like test points, are not connected to anything. 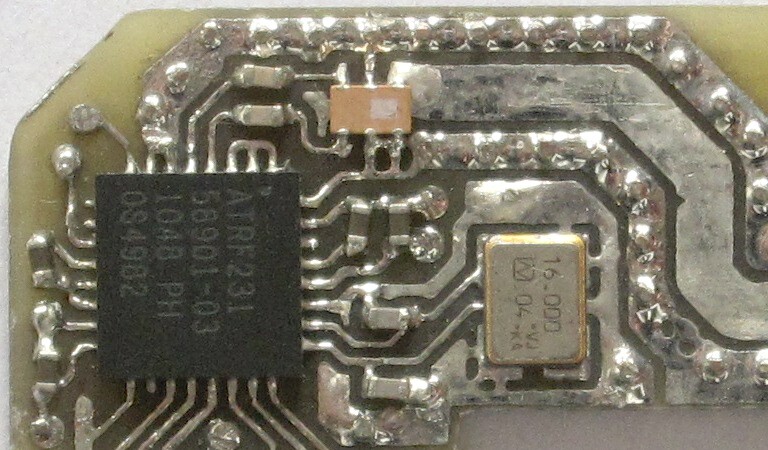 Ground can be accessed at the cover of the crystal, at the shield of the USB connector, or at the test point P11. Note that the fiducials are not connected to anything. 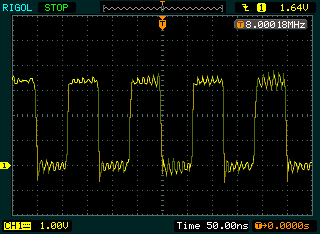 The precision of the crystal oscillator is crucial for operation. 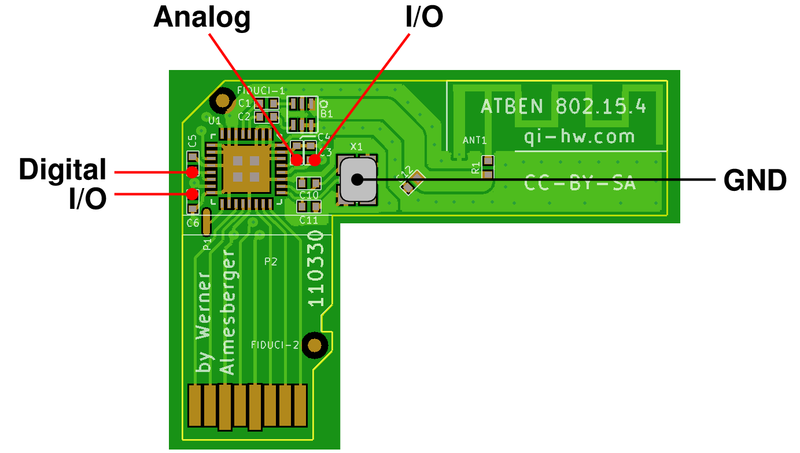 Anomalies are easy to detect with even a low-cost oscilloscope. This can pinpoint specific problems and help to select further analysis steps. 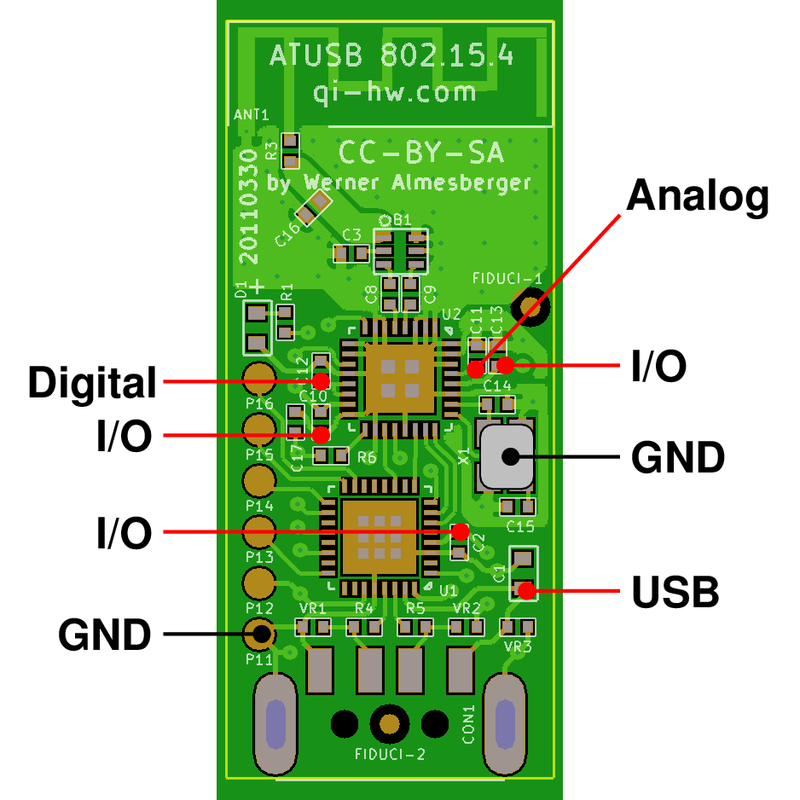 The crystal used in atben and atusb has a nominal tolerance of +/− 15 ppm at 22-28 C. Low-cost oscilloscopes typically have a timing accuracy of +/− 100 ppm, which means that only major excursions can be detected by measuring the clock output with such an instrument. Full-speed USB only requires an accuracy of +/− 2500 ppm. We can therefore consider all results within a range of +/− 1000 ppm as sufficient for an initial assessment, and perform more precise measurements by other means. This applies to atben as well as to atusb. IEEE 802.15.4 requires the transceiver frequency to be accurate within +/− 40 ppm. This configures atben as a promiscuous receiver. The reception of any IEEE 802.15.4 frame or pressing Ctrl-C will terminate the command. 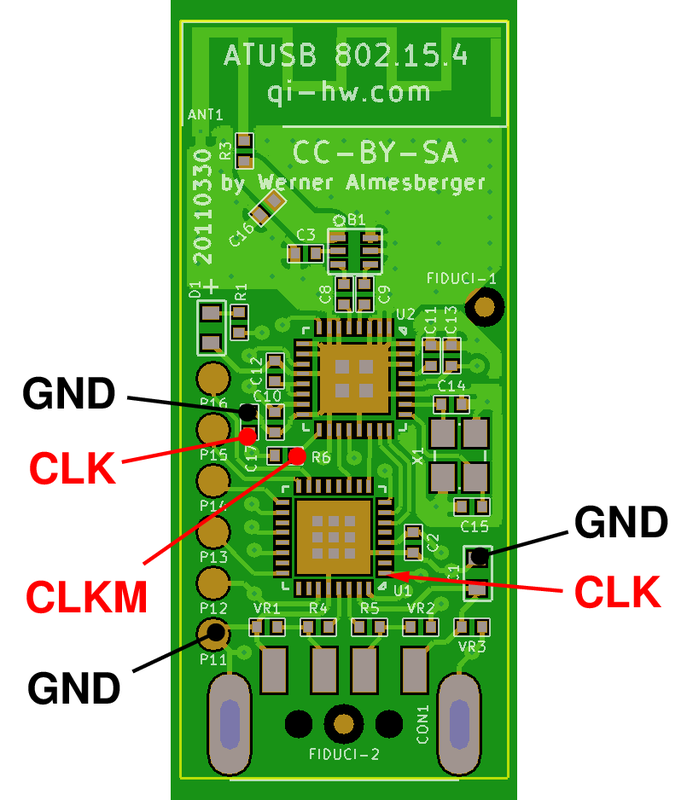 The transceiver provides the clock for the microcontroller in atusb. A clock signal is therefore always available. 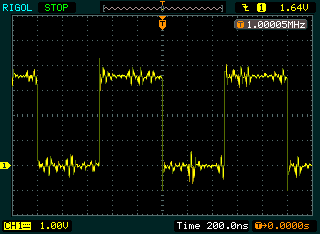 Immediately after reset, the transceiver generates a 1 MHz clock. When the microcontroller comes out of reset, it raises the transceiver's clock output to 8 MHz and then enables USB. The left screen shot shows the clock (CLKM) before the low-pass filter while the right screen shows the clock (CLK) after the the low-pass filter. Note that, if testing a board into which no boot loader has been flashed yet, the clock frequency should be 1 MHz. If an unsuccessful attempt has been made to flash the boot loader, the frequency may be 1 MHz or 8 MHz, depending on how much code was successfully flashed. The clock frequency of atben can be measured with an accuracy of about +/− 100 ppm using the program atrf-xtal. atrf-xtal runs directly on the Ben and measures the duration of packet transmissions. 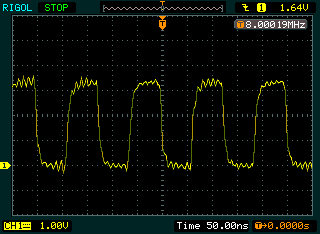 The transmission time depends on the bit clock which is in turn derived from the oscillator. The number reported is the number of poll loops the CPU counted. This value should be compared to a reference count obtained with a known to be good atben board on the same Ben at a comparable temperature. The clock frequency of atusb can be measured with an accuracy of about +/− 1 ppm relative to the PC's NTP-disciplined clock. This measurement runs for 10−60 seconds, depending on system load. Note that, in order to reach such a high precision, it is imperative that the PC clock be disciplined by NTP.